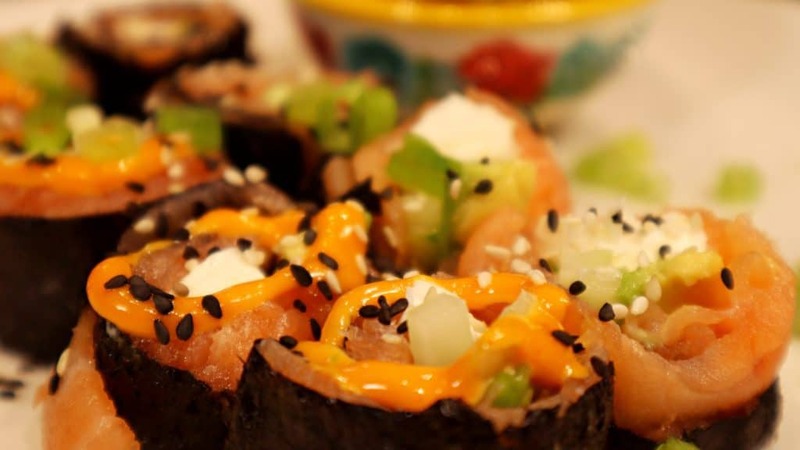 I have seen some other Keto and Low-Carb Sushi options out there, and so many of them contain Cauliflower Rice, which I think is just way too typical. Plus, cold Cauliflower Rice really just doesn’t seem all that appealing to me either. So I decided that I was going to make some sushi the other night and was thinking about the Philadelphia Roll with all of its cream cheese and salmon, as it is one of my MANY favorites. Then it hit me that rather than using the cauliflower to replace the rice, let’s use the MEAT to replace the rice. You could take this iteration and make some Spicy Crab rolls too or California Rolls, but if you do just be sure that you use REAL crab meat and not some Imitation Krab. The Imitation Krab has a LOT of carbohydrates in it, while real crab should not have any carbs in it. 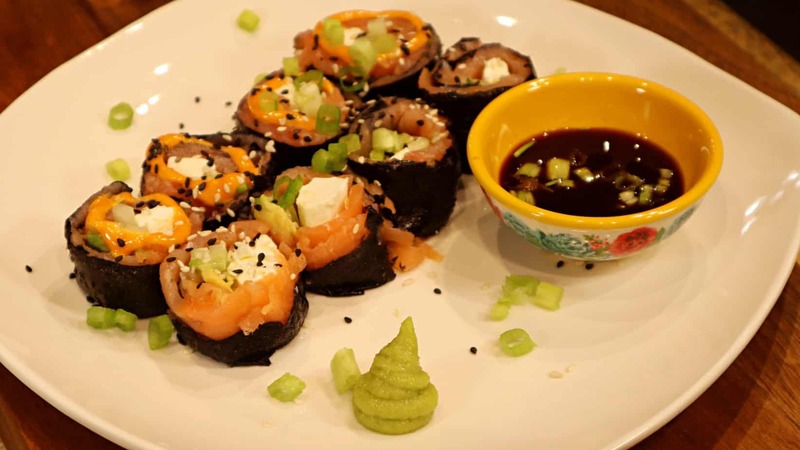 Also, when you are looking for your Smoked Salmon to make this Keto Sushi Salmon Roll, read the label and make sure that there are no sugars used in the fish. Some brands will sweeten the smoked salmon for flavor. I have noticed that the Kirkland Signature Smoked Salmon at Costco is a good one to buy, and the price is better per pound than most other stores. I am sure that you could also pick up something comparable at a Trader Joe’s too. For the Chili Mayo that I use for the Spicy versions of the roll, you can make your own at home too with some Garlic Chili Sauce and Avocado Oil Mayo if you wish. Slice the English Cucumber on the diagonal, and then thinly slice each section into approximately 1/8th inch thick strips. Cut the Avocado into slices that are approximately 1/8th Inch Thick. Cut about a 1/2 Inch strip of cream cheese off of the block longways. Cut that in half longways. Use either a Bamboo Mat, or Parchment Paper and set that down on your counter. Place the sheet of seaweed down. Take thin slices of the Smoked Salmon and place it evenly across the Seaweed. Put the Cream Cheese, Cucumber, and Avocado near the bottom edge of the sushi, about 1/2 to a whole inch from the edge. Use your Parchment Paper to help you roll your sushi, and once you get it started you should be able to finish rolling by hand. Use a very SHARP knife to cut the sushi. The seaweed can be difficult to cut otherwise. Cut into 8 to 10 pieces and serve with a small amount of Coconut Aminos (a soy sauce alternative) and optionally some Chili Mayo and/or Wasabi if you like it spicy. Top with Sesame Seeds and Green Onion for a finishing flavor.